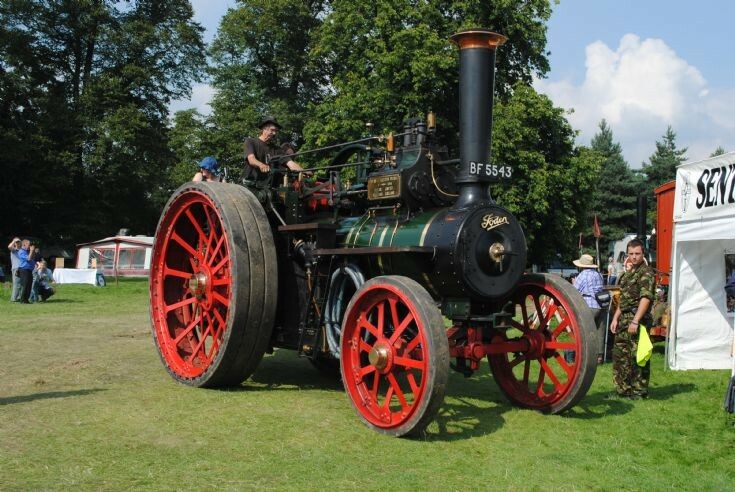 This 7 nhp traction engine named "Proud Mary" (Works No 1310) went to Australia when new. Foden's Australian agents imported the engine although it was probably shipped straight to Tasmania arriving at Brunie in 1907. New to Mr Edward Smith of Nook a village in the north west of the island for chaff cutting, by 1949 it was with a Mr Radford of the Loogana Sawmill. In the 1960's it is thought that the engine was used to provide process steam, maybe at the sawmill. Around 1995 she returned to the UK and in 1999 was purchased by the current owner, Richard Hesbrook, in kit form. The Tasmanians certainly had their moneys worth from 1310, gears worn sharp and bearing shells you could see through. The rebuild has taken 11 years. Seen at the Shrewsbury Steam Rally, Shropshire, England in August 2013.